Since the "Tea Party election" of 2010, Democrats have not held a majority of seats in the U.S. House of Representatives. A variety of factors are involved, including liberals' migration to urban areas as well as some successful redistricting efforts by Republicans in state legislatures that have tilted congressional seats in their favor. Another factor at work, however, is that less-populated areas in the country have become more Republican over time. Gerrymandering, the practice of drawing district boundaries to favor one party over another, has probably helped secure a Republican House majority until at least the next census in 2020 when the congressional seats must be reapportioned. But it doesn't explain why the GOP holds the governor's office in 33 states and has a majority in the U.S. Senate. You can't gerrymander those boundaries. One possible factor that Democratic leaders are now contemplating is the issue of abortion. More generally, 70 percent of those identifying as Democrats said abortion should be legal in all or most cases in a survey conducted last year by the Pew Research Center. By contrast, just 59 percent of Republicans polled said that abortion should be illegal in most or all circumstances. Democrats' greater unity about abortion isn't any real advantage, however, because the party's voters are so tightly concentrated in urban areas. This can be seen clearly in this map of the 2016 presidential vote by county, which I generated using tools provided by Blueshift. 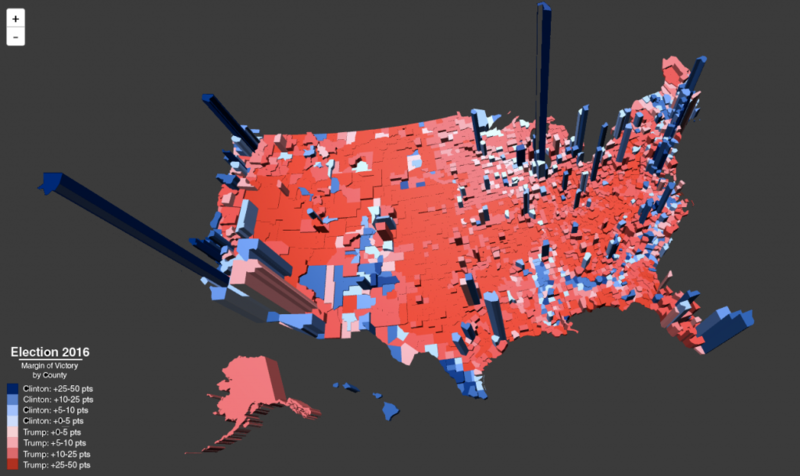 Despite the fact that Hillary Clinton won the popular vote by close to 3 million votes, her supporters were so heavily distributed in just a few areas that she still lost in the Electoral College tally. As the map indicates, there are many more counties that are strongly or marginally Republican compared with those that are heavily or slightly Democratic. Since all these highly Republican areas also have House and Senate seats, this means that if Democrats want to be competitive, they must put forward candidates who can find ways of appealing to conservative Democrats, moderate Republicans and independents. How to solve this geographic political puzzle is the dilemma that now faces Democratic leaders, and one they've been sniping about with one another since Donald Trump's surprise victory last November. The problem for the party is even further exacerbated by the fact that Democrats have been becoming more liberal since Obama first ran for president while rural and exurban areas have turned more conservative. After the Democratic National Committee's chair, Tom Perez, also came under fire for attending the same "unity rally," he responded fiercely that candidates for his party should always support abortion rights. Perez's comments appear to have rankled Rep. Nancy Pelosi, the highest-ranking woman in the party. While she is pro-choice herself, the former House speaker pushed back on the idea that all Democrats have to support abortion rights. “This is the Democratic Party. This is not a rubber-stamp party,” Pelosi said in an interview with The Washington Post published on Tuesday. How Democrats choose to address their internal abortion controversy will likely continue to be a thorny topic for at least the medium term. Polling on the issue continues to be very mixed, with the results often dependent on how the question is phrased. (Many Americans are personally uncomfortable with abortion but don't want to see it become completely illegal.) Furthermore, many of the states where pro-life sentiment runs high tend to be swing states — including the four Rust Belt states that gave Donald Trump the presidency. Pro-choice activists are arguing that the Democratic Party should remain true to protecting women's rights while many party professionals are arguing for flexibility in the service of stopping Trump. Which side will ultimately prevail remains to be seen.